The Bureau of Labor Statistics (BLS) released their monthly Consumer Price Index (CPI-U) and Inflation report for the year ending in July on August 19th . Annual Inflation came in at 0.17%. That means that something that cost $100 a year ago would cost $100.17 today. That is compared to the typical inflation of around 3% which would mean that something that cost $100 last year would cost $103 this year. The BLS rounds this to .2% which of course is so small that almost any one of the deflationary months last year would cancel out all the inflation we’ve seen over the previous 12 months. The CPI-U index a year ago was 238.250 and is currently 238.654. We have seen significant deflationary pressures over the last year with the entire 4th quarter of 2014 was deflationary with October at -0.25% in one month, then November racked up a whopping -0.54%, and December tacked on another -0.57%. And to top it all off the normally highly inflationary January (2015) came in deflationary instead at -0.47%. So those four months alone resulted in -1.83% deflation. The months of February through May were highly inflationary and they just about cancelled out the previous deflation and then June’s 0.35% brought the annual inflation rate into positive territory at 0.12% Annual inflation. Monthly inflation for July was virtually zero 0.01% but because last July was slightly negative at -0.04% as that number fell out of the calculation annual inflation inched up very slightly. Adding to the deflationary forces for 2014, July and August also saw monthly deflation as prices fell -0.04% and -0.17% respectively. Has ethanol really driven up the price of Corn? We’ve updated the Inflation Adjusted Corn Prices Chart so you can see how corn prices have changed over the years. Our Annual Inflation Chart shows how small the current blip is with two months barely visible above the zero line. We can also see how small the deflation was with Annual inflation in the last four months going from -0.20% to +0.17%. Bear markets typically are caused by one of two things: a recession or tight monetary conditions. For example, the 2000-2002 bear market featured a rough economic period in 2001 (see table below). This week’s video makes additional fact-based comparisons of the present day to both 2001 and 2008, allowing us to better understand correction odds relative to bear market odds. The New York Rate of Change chart still has its sell signal. NASDAQ still has a SELL signal. As we can see it has done a good job of tracking the most likely line for 7 months now. 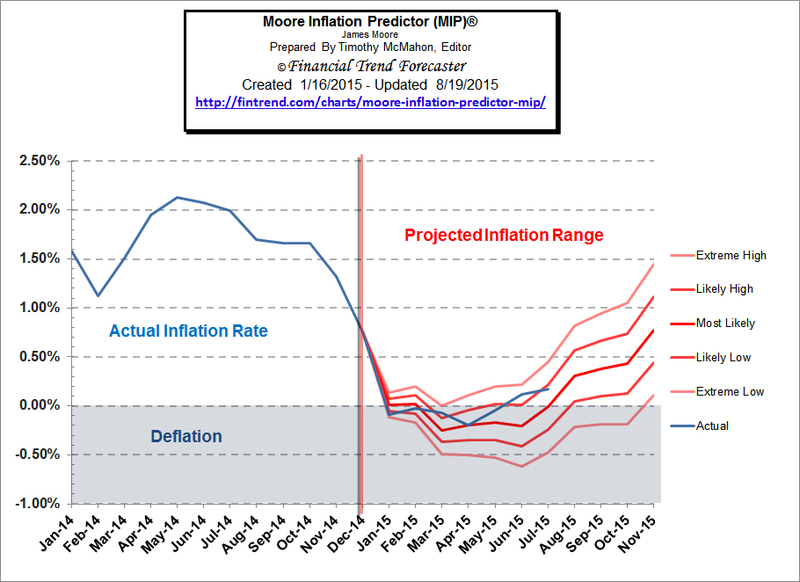 Currently the Moore Inflation Predictor is projecting a rebound in inflation up to the 2% range near year end. 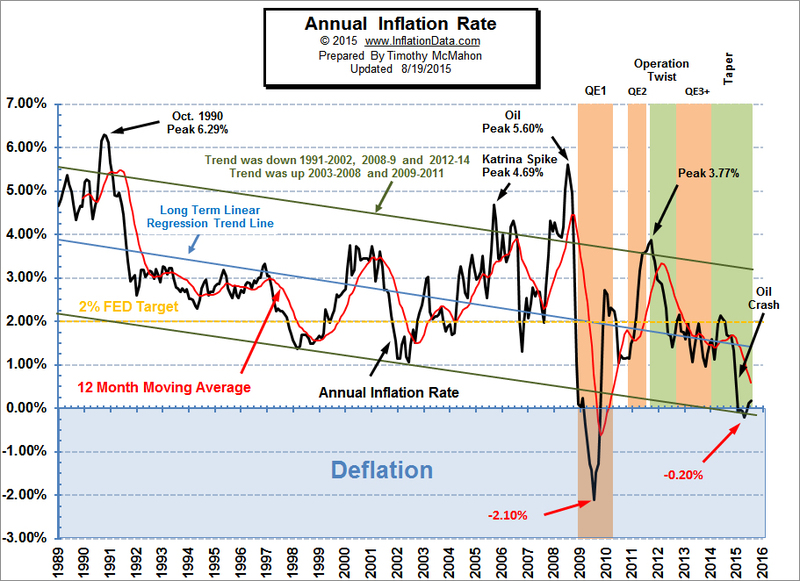 However, the new year should see some moderation in the inflation rate. For more information see Inflation Forecast. 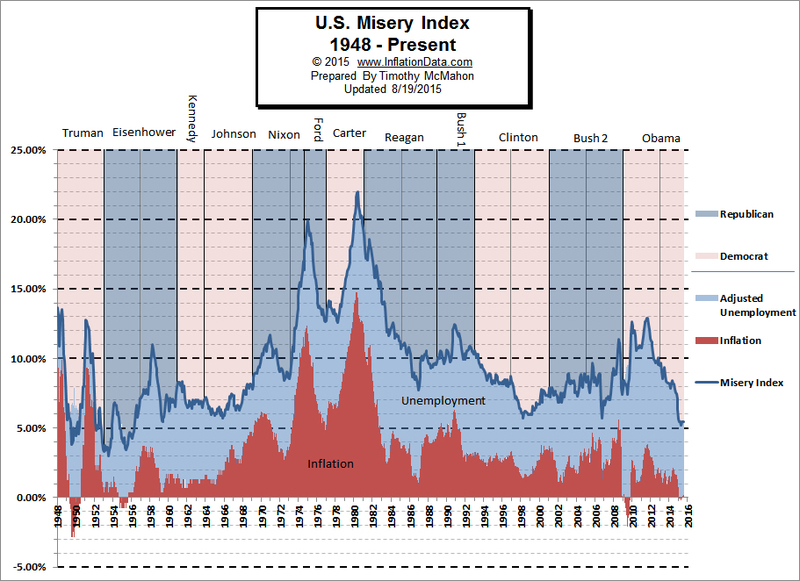 The misery index as of August 2015 (based on the most recent official government data for July 2015) is at 5.47% (5.3% unemployment and 0.17% inflation) down from a peak of 12.87% in both October and November 2011.